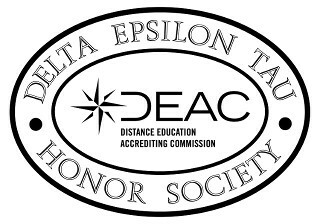 • Delta Epsilon Tau Members receive personalized Membership Certificates that profile their institutions and Chapters. • Each Certificate includes the Delta Epsilon Tau Gold Seal of Distinction. • Delta Epsilon Tau Members receive the DET Gold Key, Congratulatory Letter, and Honor Society Narrative. • Each institution is given a Chapter. • Each institution receives its own official Charter. • Delta Epsilon Tau Membership publicly demonstrates that the institution is quality-driven. • Delta Epsilon Tau Membership helps to promote programs and the effectiveness of the institution's education. • Delta Epsilon Tau Membership builds morale; and serves as a tremendous tribute to instructors. presented to community leaders and elected officials. knowledge and skills from an accredited distance learning institution. • Delta Epsilon Tau Honors are promptly delivered directly to the homes your outstanding students. • Delta Epsilon Tau maintains complete historical records for each Chapter.